Welcome to the Future. Your Newspaper Is Here. Order a one-year subscription to Times Reader 2.0 and receive a digitized version of The New York Times anytime, anywhere—and $100 off a Samsung Go™ Netbook to enhance your perusing pleasure. More on Times Reader 2.0 after the jump! Powered by Adobe AIR, Times Reader 2.0 is a downloadable app that offers a whole new way to experience The Times on your computer. Whether you prefer skimming the headlines, diving right into your favorite section or scanning the news by pictures, browsing is a breeze. Times Reader 2.0 archives the last 7 days of the world's finest journalism. You can take a whole week's worth of The Times with you wherever you go. Without needing an Internet connection. And every time you connect to the Web you will get the latest news updates, and access to exclusive videos. And the new crossword puzzle technology lets you erase and change your answers. And if you get stuck, you have the option of revealing a letter, a word or even the whole puzzle. Not that you need hints, but we're just saying. 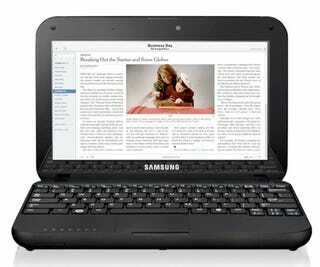 Subscribe to Times Reader 2.0 today and receive $100 off a Samsung Go Netbook!